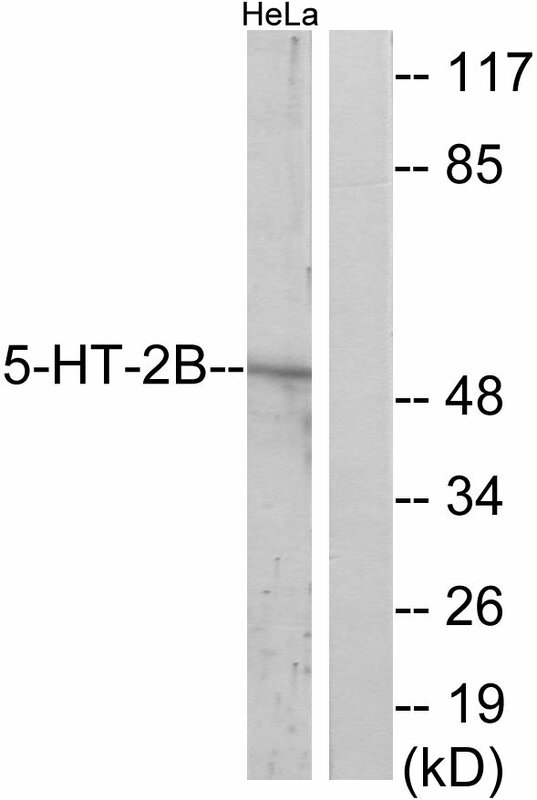 5-HT-2B Antibody detects endogenous levels of total 5-HT-2B protein. The antiserum was produced against synthesized peptide derived from human 5-HT-2B. Stable at -20 degree C for at least 1 year. Small volumes of anti-5-HT-2B antibody vial(s) may occasionally become entrapped in the seal of the product vial during shipment and storage. If necessary, briefly centrifuge the vial on a tabletop centrifuge to dislodge any liquid in the container`s cap. Certain products may require to ship with dry ice and additional dry ice fee may apply. 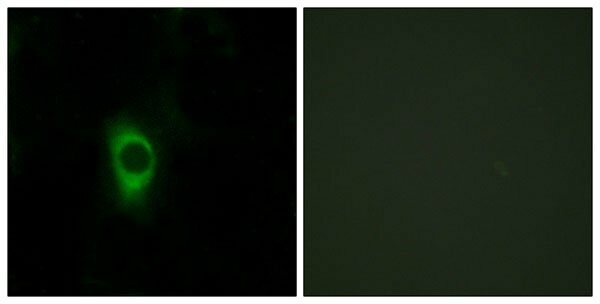 Immunofluorescence analysis of HeLa cells, using 5-HT-2B Antibody. The picture on the right is blocked with the synthesized peptide. 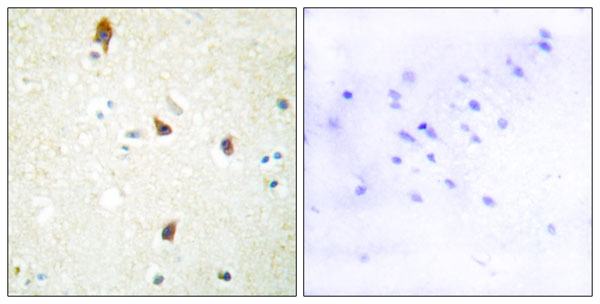 Immunohistochemistry analysis of paraffin-embedded human brain tissue, using 5-HT-2B Antibody. The picture on the right is blocked with the synthesized peptide. Western blot analysis of lysates from HeLa cells, using 5-HT-2B Antibody. The lane on the right is blocked with the synthesized peptide. NCBI/Uniprot data below describe general gene information for 5-HT-2B. It may not necessarily be applicable to this product. G-protein coupled receptor for 5-hydroxytryptamine (serotonin) (PubMed:8143856, PubMed:7926008, PubMed:8078486, PubMed:8882600, PubMed:18703043, PubMed:23519210). Also functions as a receptor for various ergot alkaloid derivatives and psychoactive substances (PubMed:8143856, PubMed:7926008, PubMed:8078486, PubMed:12970106, PubMed:18703043, PubMed:23519210, PubMed:23519215, PubMed:24357322, PubMed:28129538). Ligand binding causes a conformation change that triggers signaling via guanine nucleotide-binding proteins (G proteins) and modulates the activity of down-stream effectors (PubMed:8143856, PubMed:8078486, PubMed:8882600, PubMed:23519215, PubMed:28129538). Beta-arrestin family members inhibit signaling via G proteins and mediate activation of alternative signaling pathways (PubMed:23519215, PubMed:28129538). Signaling activates a phosphatidylinositol-calcium second messenger system that modulates the activity of phosphatidylinositol 3-kinase and down-stream signaling cascades and promotes the release of Ca2+ ions from intracellular stores (PubMed:8143856, PubMed:8078486, PubMed:8882600, PubMed:18703043, PubMed:23519215, PubMed:28129538). Plays a role in the regulation of dopamine and 5-hydroxytryptamine release, 5-hydroxytryptamine uptake and in the regulation of extracellular dopamine and 5-hydroxytryptamine levels, and thereby affects neural activity. May play a role in the perception of pain (). Plays a role in the regulation of behavior, including impulsive behavior (PubMed:21179162). Required for normal proliferation of embryonic cardiac myocytes and normal heart development. Protects cardiomyocytes against apoptosis. Plays a role in the adaptation of pulmonary arteries to chronic hypoxia. Plays a role in vasoconstriction. Required for normal osteoblast function and proliferation, and for maintaining normal bone density. Required for normal proliferation of the interstitial cells of Cajal in the intestine ().